Kenly Hiller worked along the shore at the Waquoit Bay National Estuarine Research Reserve in Falmouth. Hiller is trying to raise $6,000 so she can design and study barriers that block nitrogen runoff from polluting coastal waters. Before environmental biologist Kenly Hiller submitted her latest research proposal for funding, she sent it out for one final review. She wanted her grandmother’s opinion. Hiller’s grandmother was the perfect critic — not because she is a scientific expert, but precisely because she is not. The results so far? Scientists who were used to turning to government agencies to fund their work are learning that friends, family, and strangers are willing to chip in small and large sums. They are finding that a wide range of projects can win support: A $1.5 million proposal to build and launch a telescope into space was backed by more than 17,000 people, and a master’s student at Antioch University New England raised $3,212 to test different baits used to attract cheetahs in the wild, so they can be tagged. The most surprising insight may be that the outreach — explaining research and how it works to a general audience — is, itself, rewarding. Crowdfunding is probably best known for helping artists make albums or movies — tangible products that people are already familiar with paying for. But increasingly, scientists are posting basic research projects on general crowdfunding websites. Some science-specific sites are also emerging. It is difficult to quantify the size of the nascent science niche, but it is tiny compared to the billions the federal government spends on energy, health, and basic science research. No one sees crowdfunding as replacing that critical source of funding, because it tends now to support pilot projects, with budgets of a few thousands dollars. Ethan Perlstein, an independent scientist who raised $25,000 to support a research project and also serves as a consultant for the science-specific crowdfunding site, Microryza, said the websites seem to thrive best when they are founded by scientists with social networks they can tap and a deep understanding of the role the funding will play in the laboratory. A few years ago, Jarrett Byrnes, now an assistant professor of biology at UMass Boston, and his colleague, Jai Ranganathan, came up with the idea for #SciFundChallenge. Ranganathan had heard about a crowdfunding project that raised tens of thousands of dollars to build a Robocop statue in Detroit. “We said, ‘Why can’t we do this for science?’ This seems like the perfect opportunity to enable young researchers, in particular, to get the word out about their work, to build an audience for their work, and really communicate with the public and get a reward for their outreach,” Byrnes said. Byrnes decided he would make himself one of the initial guinea pigs. He feared that only splashy, accessible projects would garner attention and funds, while important, incremental, and often technical studies would not. So he proposed an ambitious fund-raising goal for a significant but boring project. He tried to raise about $6,000 to support research cruises that would test whether fish-counting methods that are used to survey the sea floor are consistent and accurate. He got to two-thirds of his goal — enough to fund two research cruises. So far, #SciFundChallenge has a success rate of about 37 percent of projects raising their full goal, a percentage that is improving with each successive round. On average, scientists set out to raise about $3,300. At Microryza, a San Francisco-based company that was founded by scientists to help scientists raise seed funding for early or risky ideas, over $300,000 has been raised for about 50 projects. Hiller is midway through a campaign on Microryza. 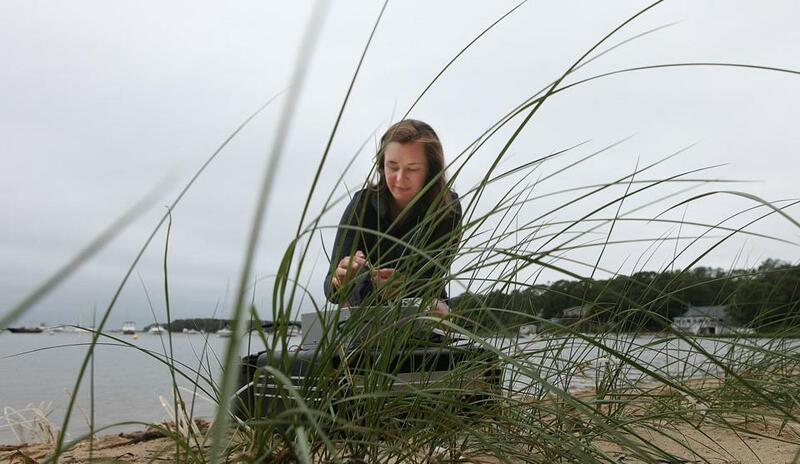 The graduate student from the University of Massachusetts Boston is about a fifth of her way toward the $6,000 goal, which will allow her to design and study miniature versions of barriers that are used to block nitrogen runoff from polluting coastal waters. She wants to learn whether the barriers inadvertently increase the amount of mercury in the environment. Hiller’s grandmother deemed the pitch, which was shot in the biologist’s apartment on a laptop, worthy of a donation. Now, researchers are putting crowdsourcing itself under the microscope. Perlstein said detailed followup of his own $25,000 project revealed that his funders were mostly male and between 18 and 45 years old. About half were scientists. Of the 385 donors, nearly half were complete strangers. Byrnes is carefully tracking how e-mails, tweets, and outreach to the media result in page views of projects, and how many of those, in turn, lead to contributions to improve the funding process. David Kipping, a fellow at the Harvard-Smithsonian Center for Astrophysics, last year raised more than $10,000 through a science-specific crowdfunding website called Petridish that is not currently active. The money funded the purchase of a new supercomputer that will speed the search for moons orbiting planets in other solar systems. The funding process is different than the traditional peer-review process, but Kipping and others said they have been surprised at the depth of the questions they have received from potential funders, who may question statistical methods, technology choices, and the budget. The researchers determine what donors receive. Some offer to mention their names in scientific publications, while others offer tokens of thanks such as — in Kipping’s case — the opportunity to name the supercomputer.